Children, adults, professional tree experts and amateur tree lovers are invited to participate in this project by finding and nominating trees remarkable for their historic, cultural, ecological, or aesthetic significance. I would like to document and photograph trees that are especially noteworthy. Please add your stories about trees beloved for unusual reasons and praised in unusual ways with your comments. The event is now over, but this Smilebox invite was for a free presentation about the Remarkable Tree Project. Click to view details. 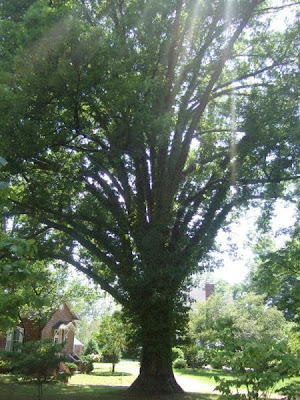 The picture above shows another huge oak (a white oak) on the Piedmont Arts' property nearby the post office, which can be seen in the bottom left corner. The post oak is growing alongside that building, on the right hand side. Thanks to Tamara Poles, with the Virginia Museum of Natural History, for documenting this tree. This was the first entry for the city of Martinsville in Jeff Kirwan's Remarkable Tree Project. Jeff Kirwan visited Martinsville October 20, 2009. Hosted by the Southwestern Piedmont Virginia Master Naturalists, he taught a class for local Virginia Master Naturalist Program. A special weeklong class for local science teachers will provide the basic requirements needed for becoming a member of the Southwest Piedmont Virginia Master Naturalist Program. This class is being organized by Rachel Wingfield. Teachers can apply for 40 hours CEU points. Labels: "Piedmont Arts" "Remarkable Trees" "Jeff Kirwan" "Virginia Museum of Natural History" "Tamara Poles" "Martinsville" "Little Post Office"
If you are a member of my generation, you probably have never seen an American Chestnut tree, or realize how big they can become. When I hear the word chestnut, Chinese chestnut trees come to mind. As children, we collected fallen nuts from our neighbors' yards. Those trees were never bigger than an apple tree, so it surprised me to learn that the majestic American Chestnut tree often soared to heights of over 100 feet. In the picture to the right, there are two men standing between three American Chestnuts, dwarfed by the base of these trees. American Chestnuts grew quite rapidly, leaving other woodland trees in their shadows to compete for food resources. An estimated 3.5 billion American chestnut trees...gobs and gobs of them, formed thick dense canopies. As recently as 1910, chestnuts ranged (see map here) throughout the eastern forests from Maine to Georgia! Then the blight was transported to our country on Chinese Chestnut treestock. Between 1927 and 1937, the most important tree in our Eastern forest was reduced to insignificance as American Chestnut giants became leafless. However, the root systems beneath the stumps of the dead tees were somehow able to survive the blight. "The American chestnut was not just the dominant tree in many forests but one of the most prolific nut trees in the eastern region of the United States. Its annual nut crop was a dietary staple for large populations of white-tailed deer, bear, squirrels, and wild turkeys. The nuts were so vital to these wild creatures that after the chestnut’s demise, the animal populations dependant on it as a food source crashed as well. Today they have barely recovered from the loss of their chestnut-forest habitat in the Appalachian Mountain regions. Chestnut trees were also useful to people. The nuts, harvested and sold to farmers for animal feed, were important to the rural economy until the 1920s and 1930s. The tannin found in the nuts and wood was used in the leather-tanning industry and as pigment in wood stains for the furniture industry. Chestnut lumber was rot-resistant and was widely used for buildings and fences. Many 18th- and 19th-century log cabins were made of old-growth chestnut logs and still stand today as a testament to the durability of the wood. The chestnut was so useful that some people called it the redwood of the East." I find it fascinating that a few trees in Virginia and North Carolina seemed to survive that blight to this day. Will Cook, with the biology department of Duke University in North Carolina, has photographed trees in both states and posted them online here. A healthy 51' tall tree (13.5" circumference) is noted from Carroll County, Virginia. Besides its large size, this individual tree is quite unusual in that it is not a stump sprout. Again and again, tender shoots rise up from the roots of these dead stumps. Once the sprouts become a few years old though, they usually become infected with the blight and die back unless grafted onto blight resistant Chinese chestnut trees. How interesting that the tree that caused the demise of the grand American Chestnut also provides the genetics for the breeding program that will help to save it! The grafted trees are able to provide American Chestnut pollen to fertilize Chinese chestnuts. Offspring are backcrossed again with American Chestnut pollen. Attempts to hybridize remaining American chestnut trees with blight-resistant Chinese chestnuts have resulted in a species that is about 15/16ths American chestnut with the protection found in the Chinese species. The goal of the American Chestnut Foundation (TACF) is to restore the American chestnut tree to its native range within the woodlands of the eastern United States. The ACF havested the first blight-resistant nuts in 2005, and will begin reforestation trials with blight-resistant American-type trees. Perhaps in my lifetime, most of my generation will be fortunate enough to see an American Chestnut tree towering in their horizon. Surviving trees generate great excitement, as they provide valuable genetic material and hopefully a key to disease resistance. If you know of any, please contact the Virginia Chapter of the American Chestnut Foundation. They provide a printable mail-in form to submit with a leaf and twig sample. An analysis of the characteristics and microscopics will be completed by a TACF identification expert and the results will be sent to the submitter. One of the most intriguing things I learned in my Virginia Master Naturalist training is how abundant and significant the American_Chestnut used to be throughout in our area. The species was devasted by the chestnut blight (another post provides details to relate to the chestnut's glory days). It was with great ceremony that an American Chestnut seedling was planted up at Philpott Lake's overlook near the Visitor Assistance Center. 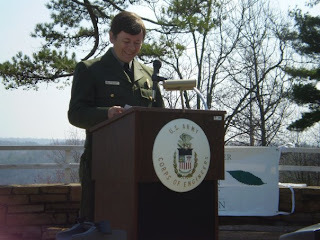 Danny Martin, Park Ranger, USACE, addressed attendees, "Its very fiber is resistant to decay.. It has withstood foreign attack and continued to endure. It is now undergoing change to enable it to again become 'The Mighty Giant'. This tree has truly earned the right to be called the AMERICAN Chestnut." The Martinsville Bulletin did a newstory on it. I attended the ceremony, added some dirt to the tub for the tree, and walked down to photograph it after it had been placed in the ground. 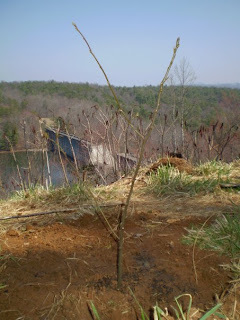 A few weeks later, I revisited the tree, and was pleased to find it had been protected with railing and fencing. Getting mowed or eaten by deer would've been a sad ending for such an investment of research. 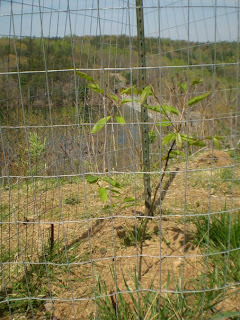 A few weeks later, new leaves greening the sapling. The Remarkable Trees of Virginia Project! Jeff Kirwan, who helped to design that site, is a Virginia Tech professor and 4-H Extension Specialist. He introduced me to his Remarkable Trees Project during my training to become a Certified Virginia Master Naturalist in classes held at the Virginia Museum of Natural History. This blog, and it's upkeep, will serve as part of my volunteer hours to remain certified, and to encourage others to enroll in Virginia Master Naturalist's program. Search the website's tree nominations for white oaks alone, and you would find nominations from people in over twenty cities and counties who have nominated, among other trees, a tree famous for “being the lone friend of a slave girl,” a tree beloved by office workers in a business park, a tree under which Stonewall Jackson prayed, and a tree “with the potential for 40 to 50 cords of firewood”! Children, adults, professional tree experts and amateur tree lovers are invited to participate in the Project by nominating trees remarkable for their historic, cultural, ecological, or aesthetic significance. By nominating them online at the project's Virginia Tech website, a record will be created for reference. Participants contacting me through this blog will help me to document and photograph any trees that are noteworthy. Please add your stories about trees beloved for unusual reasons and praised in unusual ways with your comments. This blog's purpose is to provide an opportunity to involve local citizens in a search for our area's most notable trees. Hopefully, this blog will help educate our citizens so they will be more apt to recognize, enjoy and protect the most significant trees in our hometown area! Certainly, the history and stories connected to our area's trees would make some interesting reading. My plans are to create a website featuring some Martinsville's most marvelous trees and their stories. Labels: Martinsville "Henry County" Virginia "remarkable trees" "Virginia Master Naturalist" "Southwest Piedmont"
Although I was born in Maine, I grew up in Martinsville, Virginia. My husband and I own a couple of guesthouses in the historic district of uptown, and are Virginia Master Naturalists. Been certified as an educator, a massage therapist, a Virgina Master Naturalist and a BodyTalk Access Technician.